Sri Krishna is the Supreme Lord and the origin of the entire creation. He possesses all the six opulences – wealth, strength, fame, beauty, knowledge and renunciation – to an unlimited degree. The Vedic scriptures like Srimad-Bhagavatam and Brahma Samhita vividly describe the glories of Lord Krishna. In the Bhagavad-gita, Lord Krishna clearly declares Himself the ultimate purpose of all sacrifices and austerities, the Supreme Lord of all planets and demigods and the benefactor and well-wisher of all living entities. This is also confirmed by all great acharyas like Madhvacharya, Ramanujacharya, Shankaracharya, Chaitanya Mahaprabhu, etc. Brahma-samhita states that the abode of Lord Krishna is always served by hundreds and thousands of goddesses of fortune (Lakshmis). 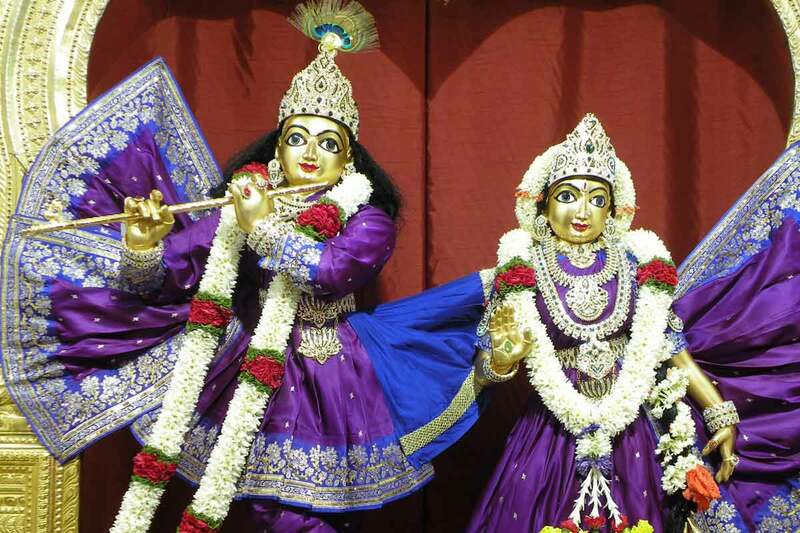 The chief of the goddesses of fortune is Srimati Radharani. She is Krishna’s eternal consort and the embodiment of pure devotion to the Lord in its highest degree. She is the pleasure counterpart of the Lord and is nondifferent from Him. Contribute towards sevas such as Deity worship and alankara which are daily performed to Sri Sri Radha Krishnachandra. Daily Darshan at Hare Krishna Hill, Bangalore.